Year's end finds 2 countries setting different courses to combat the recent spate of pirate attacks in the Gulf of Aden off the coast of Somalia. Yet in the same courthouse a few months earlier, a different federal judge, in the case of United States v. Said, had dismissed a piracy charge brought against 6 other Somali men. Tripping the latter judge up was Congress' reference in § 1651 to "the law of nations." The opposite rulings reflect uncertainties about whether an old legal framework presents the proper way to proceed against 21st C. pirates. It's a puzzle addressed in this discussion by our OJ colleagues, and in many IntLawGrrls posts available here. In the United States, the discrepancy next awaits consideration by the Virginia-based Court of Appeals for the 4th Circuit. France, meanwhile, has taken another tack. 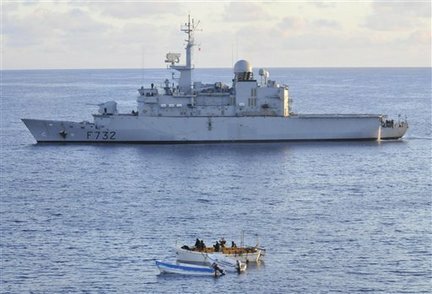 France also has been involved in policing piracy in the Gulf of Aden. (credit for March 2010 of French naval vessel, with "Somali pirate skiffs" in foreground) France also has found that its old laws fell short -- and so it's opted for a legislative fix. Shortly before Christmas, the Sénat voted unanimously in favor of the Loi de lutte contre la piraterie et d'exercice des pouvoirs de police de l'Etat en mer -- a bill to ease the pursuit and punishment of pirates that the legislature's lower house already had approved. ► An 1825 French antipiracy law having been abrogated in 2007, the newly adopted law reintroduces into the penal code the crime of piracy -- a crime may be pursued via universal jurisdiction. The new law applies to acts of piracy "within the meaning of" the 1982 U.N. Convention on the Law of the Sea, "committed ... on the high seas," "in maritime spaces outside any state's jurisdiction," and "when international law permits, in a state's territorial waters." That Convention is an artifact of the law of nations to which France has been a state party since 1996, but to which, as posted, the United States does not belong. ► The new statute further establishes a legal regime for detaining suspects onboard French naval vessels while they are being transported to judicial authorities. 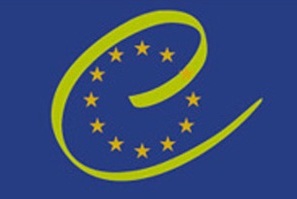 These Mesures prises à l'encontre des personnes à bord des navires respond to a March 2010 judgment, Affaire Medvedyev et Autres c. France, in which the European Court of Human Rights held that France had violated the guarantee of liberty and security of person in Article 5 of Europe's human rights convention by its high-seas detention in 2002 of members of a ship's crew who were suspected of trafficking in drugs.